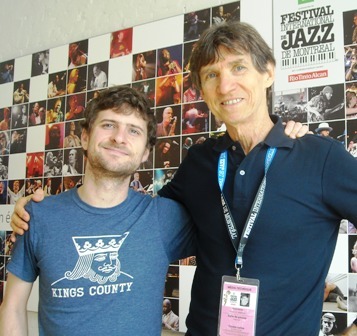 Montreal Jazz Festival 2015 Mid-Festival Review Part 3-The Wrap Up! My first stop is to Saint Laurent Street and the familiar confines of Club Soda to hear the 8-piece wonder that is Norway’s Jaga Jazzist. Question…have you ever been in the path of a rampaging bull elephant coming right towards you that had no desire to get out of your way? That was the beginning, middle and end of the performance by these folks (seven men and one woman) who came from Oslo to serve up their unique blend of electric and acoustic instrumentation, rock-jazz-classical-electronica-who knows what, designed to assault and thrill the raving crowd that hung on every note. Standing on a stage among a field of 5-foot high blinking neon trees (you had to be there) the band exploded from the first note with joyous sound and spirit that was nothing short of astounding. There wasn’t much subtlety in this presentation, though there certainly are dynamics in the music, but the volume and performance was full throttle from the beginning to the end. 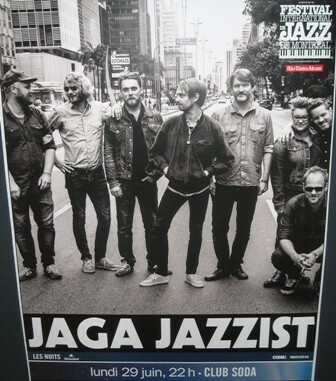 Jaga Jazzist has been around since they were in their teens and now, almost 20 years later, their music has arrived at a point where their fully formed style is totally their own. With electric keyboards, guitar and bass, the versatile horns and woodwinds players who double as percussionists and vocalists, all driven by the pounding drums of Martin Horntveth, Jaga Jazzist served up music from their newest release Starfire and selected cuts from previous releases. There are almost no words to fully describe the style that is Jaga Jazzist music. When I imagine what people from say 150 years ago thought “the music of the future” would sound like, this is that music and these are the people who make it! It could qualify as many things stylistically. Though the band seems to play as a single unit moving through all the progressions and musical changes, there are occasional moments for the guitarist, saxophonist, flutist or keyboardist to take a brief lead before the single cell organism that is the band as a whole explodes and takes off again to soar to another exuberant peak. Just go see this band should you have the chance, but bring an open mind and be ready for VOLUME!! I’d also been looking forward to witnessing firsthand another worldwide phenomenon, the duo from Mexico that call themselves Rodrigo Y Gabriela. What a story is this one, guitar-playing members of a Mexico City heavy metal band who decided to take off as a duo to busk on the streets of Europe. Before long they’d found a unique style, an audience, representation that booked them on the European festival circuit and as they played to stunned and thrilled audiences their style developed further. They’ve recorded with accompanying musicians like a 13-piece orchestra from Cuba, sitar great Anoushka Shankar and others, but their bread and butter is playing as a duo and most of their releases are live recordings from around the world. Rodrigo Sanchez and Gabriela Quintero could not remember if they’d played Montreal before until an audience member told them it was their second time. Hey, give them a break. They are living out of suitcases, and guitar cases, and they’re all over the place all the time. This was the end of a short North American tour and they’d be leaving again for Europe the next day. In the meantime they had one more powerful set to unleash on a packed house in the beautiful Salle Wilfrid-Pelletier that knew every song and hung on every note. They know how to get friendly with an audience and even invited about 30 or 40 of them to join them onstage to dance along with them while they played. The message in the performance by Rodrigo Y Gabriela is “simple” and that means musically and emotionally. They mentioned that they didn’t usually play to seated audiences, thus the invitation to join them on stage and to rise to your feet if you are sitting while they play. I’ll call the performance “The Beautiful People Play Heavy-Metal Flamenco.” These two are, shall we say, easy to look at! They can certainly play but back to the term simple. There is plenty of improvisation by each of them but the music is mostly about the rhythm as they kick into simple chord progressions, repeat them and kick up their heels while they invite the audience to do the same. It’s a party! They use their guitars like congas so they need no percussionists and the audience keeps the beat with constant clapping. If you don’t want to get up and have fun you have probably come to the wrong show. Flamenco purists might want to stay home too and if you’re looking for intricate compositions this ain’t your show either. Sometimes I felt like they were playing the song they’d just played, but who cares? It’s fun and sometimes that’s exactly what you need! The final chapter of my Montreal 2015 journey came inside the cavernous club/edifice/cave that is Metropolis. To fill this place you’ve got to bring a big crowd with big energy and create a big sound. All of the above occurred with the Snarky Puppy show on Tuesday night, June 30th, my last in Montreal this year. In the conversation with Michael League that I mentioned earlier I discovered that though jazz is certainly a big part of the musical message of the band it’s only a portion of what they have to offer stylistically and they feel no major obligation to carry jazz on their backs further into the 21st century. I’d seen them perform at the 2014 Newport Jazz Festival and they gave a very “jazzy” show that had baby boomers and teenagers in the crowd both bobbing their heads and tapping their feet together. On this night in Montreal they knew they had a rabid, loud, young crowd that was mostly standing and ready to rock. Michael League had told me that gospel and soul music had been original, major influences along with rock and jazz and the set began with a soulful groove that quickly exploded into full-blown rock. There have been 30 musicians who’ve been part of the band at one time or another and I learned that they still come and go from time to time. On this evening there were 8 Puppies on stage, two drummer/percussionists, two keyboardists/trumpeter/percussionists, 2 multi horn/woodwinds players, bass and guitar. The sound was big and electric and it needed to be! There was the occasionally horn lead to give the set some jazz element along with some familiar Snarky Puppy funk and hip hop passages and even a guest vocalist, from Montreal no less, who joined in with a very soulful presentation and a spirited rap to complete the mix. It was another spectacular show at this marvelous festival and I can’t wait until the 37th edition in 2016! « Montreal 2015 Mid-Festival Review Part 2: Molly does Billie, Glasper Trio & Rosenwinkel Quartet + Scofield & Lovano Swing!